What others say about chiropractic care can help you make the right health care choice. 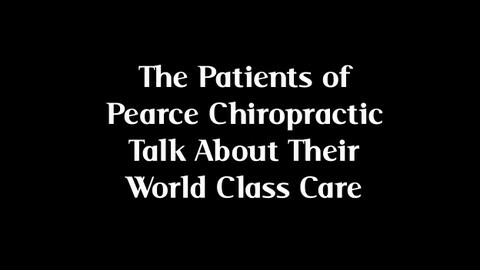 Review a selection of Pearce Chiropractic patient testimonials below and please email me or contact the office if you have any questions. Since I discovered you, I have only had the two treatments and I am extremely improved. The first time you adjusted my neck far down between my shoulders I thought I would come off the table. It wasn’t really bad pain, it was more like a release. I had a lump in my left shoulder since the accident and I could not turn my head very far to the left at all. It made driving very difficult, especially when I had to turn and look to the left. Also I could not stand to have the radio on in my car. The noise was such a major distraction and made me very nervous. It has been four years since I could listen to the radio while I drove. The radio or CD player has been on nearly all the time since my first adjustment. Also I no longer have the lump in my shoulder. It has probably been six weeks or so and I only continue to get better. I have got my balance back and I can work long days as a hairdresser and not cave in completely when I am finished. It has been a long time since I have taken a pain pill. Also my time off of work is much more productive and fun. My husband thinks I am a new person with much more ease of movement than he has ever seen. DeAnn is my massage therapist and she has worked on me for a couple of years. She still remarks weekly about my body. She simply cannot believe that the lump between the neck and shoulder are gone. Also my neck is much straighter and not at all painful. I can’t thank you enough. I am grateful always. What a marvelous experience you have ahead of you!! She has helped me in so many ways and so often. I had no idea that my health was weak in the areas she found. The first area we explored was my emotions. As Dr. Colbert, M.D. states in one of his books, “complete healing cannot take place until the emotional issues are dealt with.” The emotional areas for me were recent and some went back to my childhood. On one of my visits she found that I was sensitive to florescent lights. This was the result of being low on Vitamin D. The solution was sitting in the sun for thirty minutes each day between 9-11 a.m. or 4-6 p.m. It worked!! Another area she has helped me with is my Ileocecal valve. She improved its function through adjustments and working two different points that strengthen this valve. The latest area she had been working with me on and continues to do so is my eyes. My tear ducts were not working correctly which left my eyes red and dry. To get them jump started, she had me cut up onions then followed this with a homeopathic remedy to get my lymphatic fluids flowing as they are part of the tear ducts. On two occasions she had found that my eyes were not tracking properly. After working the cranial points that affects this, my eyes worked together. What a difference it made in my reading. No more tiring and falling asleep. In 1969, in New Orleans, LA, a car missed a stop sign and hit my auto broadside. I suffered a painful whiplash with permanent damage to three cervical discs. Doctors suggested surgically fusing my neck. Thankfully, I did not do that. Years after, pain diminished, but cracking sounds began in the cervical 3, 4, 5 region, and the base of the skull. In 2005, sharp, warm, lightening bolts ensued from shoulder to neck. Arthritis began, the area stiffened, and became rigid. Driving was painful and dangerous. In spring of 2006, my personal care physician sent me to a local therapy center. Months of treatment there was instantaneous at best. Between treatment, the rigidness, cracking and shocks returned. In October, 2007, a friend suggested I see Dr. Nancy Pearce. I began treatment on a weekly, then twice-monthly basis, and now as needed. Through her knowledge, experience, and gentle care, I thankfully say the “electric shocks” have ceased. Turning radius has improved and I have little to no pain. After treatment by Dr. Pearce, relief lasts weeks, not days or hours. Dr. Pearce’s regimen has assisted me in ways besides chiropractic. Guidance in nutrition, exercise and neuro-techniques have resulted in a permanent weight loss of over sixteen pounds thus far, and a better mental outlook. She has provided me with personal and written information on the importance of the above principles. She is selfless and caring. This short testimony only covers the surface of how Dr. Pearce has aided me. I highly recommend her for all chiropractic, nutritional and neuro-physiologic needs. I remain grateful to her. I was feeling very unhappy, but I couldn’t explain why. I also had been eating right, exercising 2 times a day , 6 days a week and actually gaining more weight in my mid-section, this was very discouraging. I needed a 1 to 2 hour nap every afternoon just to make it through the day. I was irritated by the smallest things and really didn’t have much joy in my life. I was just simply dealing with things, not truly enjoying life. I also have had a shoulder injury for about five years that made me cranky and left me feeling as if the pain was just part of who I was. Now I feel AMAZING. Just this past weekend (mid-Oct) my husband and I hiked Mt. Harvard with a group. My husband and I could not believe the energy I had throughout the 11 hour trip. I kept thinking…I’m going to run out of energy any minute, as others in the group began to turn back because they could not sustain the strong winds and cold conditions, but I kept on trucking along as if I was a new person. I didn’t lose my energy level until we drove back home. By this time, I had been going non-stop for 16 hours on only about 5 hours of sleep. Both my husband and I were totally amazed by my performance, as in the past I would have lost steam 4 hours into the hike. As for my shoulder..prior to coming to Dr. Pearce, I had been to two chiropractors, two physical therapists, one medical doctor and a personal trainer with no relief. Dr. Pearce continues to work on my shoulder and I truly feel like I have a new limb. And, I have lost approximately 12 pounds since my first visit. It didn’t happen overnight. I started noticing changes in how I felt and began losing the weight in my mid-section in about 10 visits. I’m on about visit 19 now and am finally beginning to enjoy life again and continue to see positive changes everyday in my mood and physical body. My family and friends keep asking what I’m doing to look and feel so great. I tell them that its not just one thing; it takes a little time and effort to get everything in alignment. Dr. Pearce has helped me in numerous ways through adjustments, dietary and exercise advice, vitamin suggestions and persistence in making sure I feel my best every time I see her. My advice for others is to come in prepared to stick with it long enough to see the results. If you are fully dedicated to feeling better and work with Dr. Pearce, not against her, you will be amazed by the results. The key…you have to do your part, which may include eliminating some bad eating habits. Sound interesting? Please contact our Colorado Springs chiropractic office to make an appointment today.